Hundreds of years ago during my childhood in the 1970s and early 1980s, two of my favourite toys were Lego and die-cast metal cars. Although there were several brands of cars, everyone referred to them generically as ‘Matchbox cars’ (after Matchbox, one of the leading brands). I mostly played with my Lego and Matchbox cars separately, but sometimes I combined them by usually building Lego garages for my cars. 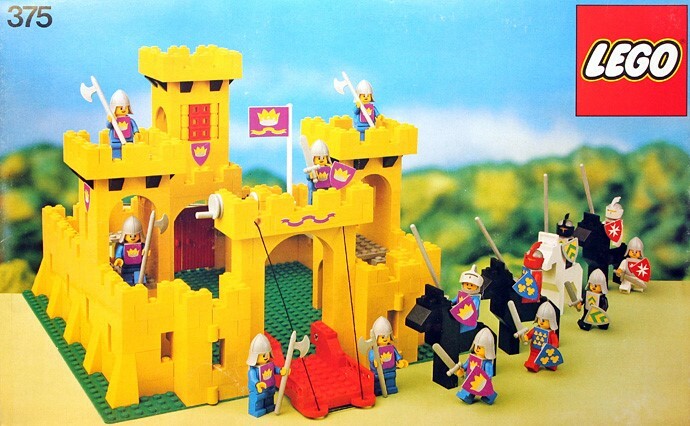 One time in late childhood, I somehow came up with another Lego idea for my cars – a castle. As it turned out, the castle wasn’t all that impressive. It was basically a large square of most of my 2×4 white bricks, built two or three bricks high on a large grey base-plate. There was a tower at each corner and gateways in two of the walls, but I can’t recall if there were any gates. I also can’t remember if there were any battlements on top of the walls. Inside the castle walls, there was nothing – just empty parking space for my cars. I think I was able to fit two rows of cars on both sides of the path between the gates. Still, I liked the idea of parking my cars in a castle instead of in a garage – it was something different, and exotic. One afternoon after school, a friend came over to play cars with me and he was impressed with the castle. It was also during that play when I had a mental image that has stayed with me ever since. As my friend and I drove our cars in and out and around my castle, I began imagining its ‘real-world’ setting. First, I decided that my castle was within a European forest somewhere in a country like France or West Germany (like I said, this was hundreds of years ago). Second, I imagined that dusk was falling over the forest. Third, I imagined lights coming on in the ‘courtyard’ of my castle where the cars were parked. Finally, who were the people who had driven to this castle deep in the forest and why were they there? They were glamorous guests at a special dinner or party in the courtyard, where they could talk and drink wine and admire each other’s cars. As I said, my castle wasn’t much physically – but that afternoon, emotionally and mentally it became a wonderful place. Over thirty years later, that castle in the forest at dusk has remained one of my favourite moments of childhood imagination to recall. Although I was briefly a motorcyclist in early adulthood, I never learned to drive and probably never will. And most of the time, I don’t regret that. As well, I never obtained the glamour or self-confidence or wealth or some or all of the above that would enable me to travel to somewhere like France or Germany, drive a nice car like a BMW or a Jaguar and be invited to a dinner or party at a castle or chateau in a forest at dusk. I probably never will either, and sometimes I don’t regret that. Also, I never developed a taste for wine or most other alcohol. And I don’t regret that most of all. But sometimes, either when I’m happy or if I get angry at myself and where my life has and hasn’t gone, it’s still fun to revisit that castle in the forest at dusk. This entry was posted in Happiness, Inspiration, My Story, Something to Think About. Bookmark the permalink.